Scientists probing the mystery of the so-called “global warming hiatus” may have made a breakthrough. According to a new study published Wednesday in the journal Nature, a persistent area of unusually cool sea surface temperatures in the tropical Pacific Ocean could explain why, despite ever-increasing amounts of manmade greenhouse gases in the atmosphere, global average surface temperatures have increased at a slower rate during the past 15 years. By running sophisticated computer models that looked at observed energy coming into the climate system, plus observed sea surface temperatures in the central and eastern Pacific Ocean, researchers from the Scripps Institution of Oceanography found that the decadal-scale cooling of a portion of the tropical Pacific accounts for most of the current plateau in global average surface temperatures. 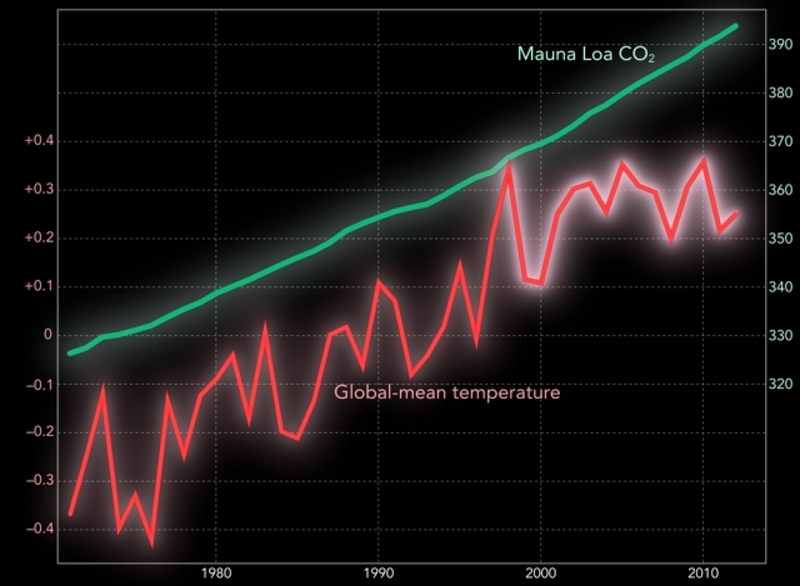 Global-mean temperature (ºC) and CO2 (ppm) for 1971-2012.Temperature is represented in terms of deviation from 1980-1999 average. 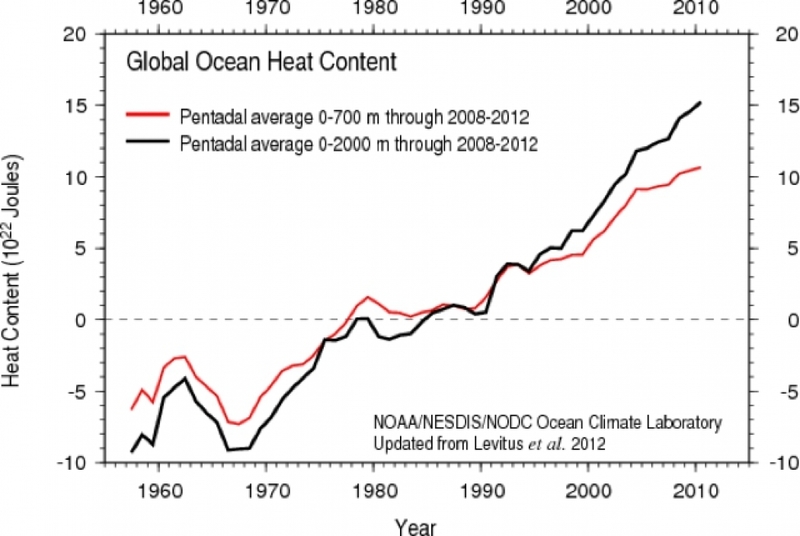 Both are based on annual mean values.The temperature for the hiatus period is highlighted. Click image to enlarge. Credit: Scripps Institution of Oceanography. That is remarkable considering that the region of ocean under scrutiny comprises just 8.2 percent of the globe’s surface, the study said. That such a small area of the planet could have such a large influence on the climate has much to do with how the Pacific Ocean helps influence global weather patterns and the transfer of heat into the air and deep oceans. For example, El Niño events, which take place in the same area of the Pacific, help boost global temperatures. While scientists lack a full understanding of all the processes involved, they know enough to list this part of the world as a chief suspect in contributing to the temporary warming slowdown. According to a forthcoming report from the U.N. Intergovernmental Panel on Climate Change, the rate of warming during the past 15 years was about 0.09°F per decade, which is a smaller increase than the temperature trend since 1951. During the 100-year period from 1901-2012, the globe warmed by about 1.6°F, a trend scientists attribute largely to manmade emissions of greenhouse gases. Study co-author Shang-Ping Xie told Climate Central that by running computer models with observed ocean temperatures from the 1940s onward, with a particular emphasis on the recent 15-year period, “We got very good agreement with the observed record, including the current hiatus that started in the late 1990s.” In fact, not only did the models reproduce the overall warming plateau, but they also showed continued warming during the summer months, and a lack of warming during the winter, which has also been shown by observations. “This was a remarkable result telling us that we are on the right track,” Xie said in an interview. While global surface temperatures have not warmed significantly since 1998, other studies have shown that Earth’s climate system continues to warm, with emerging evidence indicating that the deep oceans may be taking up much of the extra heat. That extra heat is expected to be released back into the atmosphere in the coming decades. Even with a slowed rate of warming, the first decade of the 21st century was still the warmest decade since instrumental records began in 1850. The new study is part of a surge in research examining the recent warming hiatus. Other climate scientists contacted by Climate Central who were not involved in the new study said the new work is consistent with other emerging evidence showing that natural climate variability involving the equatorial Pacific Ocean may be a key factor in modifying the rate of surface warming worldwide. Click image to enlarge. Credit: Image courtesy of Nature Magazine. In other words, natural climate variability affects the rate of global warming like a dial controlling the sound on a speaker — at some points the volume is turned up, and the planet warms faster, while at other times it is dialed back down, with a slower rate of warming. Scientists have also warned that at some point, the speaker may go all the way to 11, with warming at rates never before seen in human history, depending how high greenhouse gases climb. The study is consistent with the findings of a 2011 study published in Nature Climate Change and a 2013 paper in the Journal of Climate, which together showed that a natural climate cycle that affects the climate on decadal timescales, known as the Interdecadal Pacific Oscillation, can lead to periods of accelerated global warming as well as “hiatus decades,” depending on what phase the cycle is in. Since the late 1990s, the cycle has been in a phase that promotes cooler temperatures at the surface, but a more rapid buildup of heat in the deep ocean. Kevin Trenberth, a climate scientist at the National Center for Atmospheric Research in Boulder, Colo., who was not involved with the new study, told Climate Central in an email conversation that the paper provides valuable, but relatively limited insight. 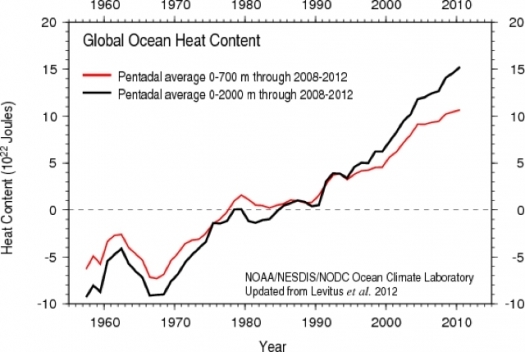 Global ocean heat content since the 1950s, showing a more rapid increase in deep ocean heat content in recent years. Susan Solomon, a climate scientist at MIT, echoed Trenberth’s skepticism about the broader implications of the study’s findings, saying the study “is a chicken vs. egg problem as it stands . . .” because it feeds the models with observed sea surface temperatures, shedding no light on why the temperatures have evolved as they have. “Did the sea surface temperatures cool on their own or were they forced to do so by, for example, changes in volcanic or pollution aerosols, or something else?” Solomon said. Another explanation that has been put forward for the global warming plateau, one that climate skeptics have seized upon, is that the climate system is simply less sensitive to increasing amounts of greenhouse gases, such as carbon dioxide, than previously thought. Human activities have been pushing carbon levels ever higher, surpassing 400 parts per million this year, the highest level on record in modern human history. Benjamin Santer, a climate scientist at Lawrence Livermore National Laboratory, expressed a similar view. “My take on the “warming pause” is that a 15-year period with relatively muted warming does NOT provide a scientifically compelling reason for fundamentally re-evaluating our estimates of the sensitivity of the climate system to human-caused increases in greenhouse gases,” he said in an email. A leaked draft of the forthcoming IPCC report said that the slowdown is “due in roughly equal measure” to natural climate variability, such as La Niña events in the Pacific Ocean, and reduced incoming energy from the sun by volcanic eruptions that help scatter incoming solar energy back into space. It also contains a slightly lower figure for climate sensitivity to a doubling of carbon dioxide levels in the atmosphere compared to the panel's last comprehensive report, which was published in 2007. The new IPCC report is due to be finalized by September 27 at a meeting in Stockholm.